With the largest intact forest cover in the Mekong, Laos has a unique opportunity to contribute to the global fight against climate change. This forest is nowhere more abundant than the southern provinces of Champassak, Attapeu, Sekong and Saravan. Here, WWF is working with key stakeholders to make sure sustainable forest and watershed areas provide food and livelihood practices to local communities, whilst ensuring forest cover is conserved for the benefit of all Lao people. WWF also works closely with the government and communities in spectacular Siphandone, known in English as Four Thousand Islands. Here, we engage in the sustainable use of fisheries and natural aquatic resources, protecting vital fish stocks, improving livelihoods and safeguarding other river species such as the globally vulnerable Irrawaddy dolphin (Orcaella brevirostris). The mist rises through Xe Sap National Protected Area, southern Laos, where WWF works on forest restoration and livelihood improvement. 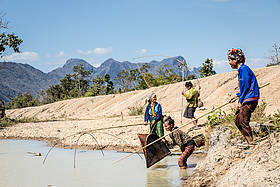 In Bolikhamxay and Khammuan provinces, WWF works on a community fishery programme and sustainable rattan forest management. Sustainable fisheries are essential for the health of freshwater ecosystems, so to ensure this is maintained, WWF is involved in mapping habitat, establishing community aquatic resource management plans, participatory monitoring of fisheries, and biodiversity surveys of turtles, freshwater prawn, fish, and crocodiles. Significant milestones have been reached in our rattan project too, as in 2011, Laos became the world’s first Forest Stewardship Council (FSC) certified rattan producer. Achieving a more sustainable rattan production will ensure a future supply and prevent negative impacts on nature, communities and companies. The involvement of communities, and especially women, in fisheries co-management directly benefits 72,000 people in central Laos provinces. This national protected area is located in Xayabouly Province in northern Laos. Identified as a top priority for elephant conservation by the government in 2008, WWF is helping to implement a strategy to improve patrolling and law enforcement within Nam Pouy as well as restore, maintain and increase the population of Asian elephants. Communities are also encouraged to adopt crop protection measures to avoid human-elephant conflict, which is another serious threat to elephants and people's livelihoods. 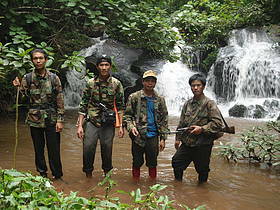 Critical to deterrring and intercepting potential poachers, WWF helps increase the enforcement capacity of NPA staff. 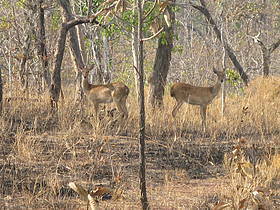 The only known population of Eld’s deer in Laos occurs within the Savannakhet Eld’s deer sanctuary, founded in 2005 in a partnership with the provincial government and NGOs. However, threats to the ecological integrity of the landscape in which the sanctuary is located are escalating. Of particular concern is the potential for rapid habitat conversion of the dry forest for intensive agricultural industrial practices. WWF supports villager-led patrolling of the sanctuary and provides development initiatives within local communities to incentivise sustainable livelihoods and to reduce threats to deer and its habitat. Eld's deer is a graceful but elusive species.